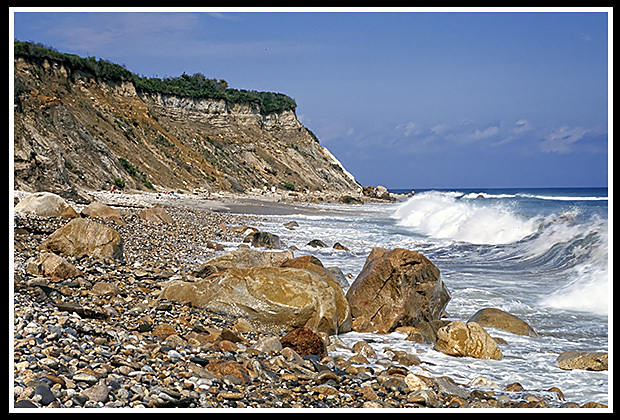 Block Island is about 12 miles south of the Rhode Island mainland and about the same distance northeast of Montauk Point, New York. Block Island was a resort island for the wealthy and is still a major player for Rhode Island’s tourism industry today. Two lighthouses were built on Block Island to guide shipping traffic, mariners and local fishermen along Block Island Sound entering and leaving the island. Block Island is three miles across at its widest point and 7 miles long. It boasts 365 freshwater ponds and is home to over 200 endangered animal and plant species. Block Island is one of Rhode Island’s most popular attractions, with its unspoiled 19th century architecture, 17 miles of beaches, and over 30 miles of trails for hikers and bikes. The best ways to get around the island may be to first to leave your car at the ferry dock on the mainland, rent a taxi, moped, or horse, or just bike of hike your way around the island. One of the beaches, Crescent Beach, provides scenic biking trails that lead from Rodman’s Hollow to huge clay cliffs along the coastline. The Mohegan Trail leads around the 200-foot cliffs of Mohegan Bluffs with great views of the ocean and shoreline. To actually get to the beach, you'll have to walk down more than 140 stairs and climb over some rocks and boulders. Visitors will find the constantly growing outdoor gallery of rock “cairns” or rock sculptures nearby to explore. 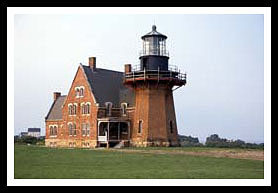 Block Island Southeast Lighthouse has a small museum and is open to the public in the summer. The two-mile Crescent Beach area consists of four beaches: Frederick J. Benson Beach, Scotch Beach, Mansion Beach, and Ballard’s Beach. Ballard’s beach is close to the ferry landing, and is a private beach for visitors who stay at Ballard’s Inn can enjoy. Here you’ll find live music and have your food and drinks from the restaurant delivered right to your beach chair. Block Island North Lighthouse, is near the 127-acre Block Island National Wildlife Refuge. Be wary that the hike to Block Island North Light is a few miles, with few amenities. With miles of open beaches you can fish from the beach, or take a charter boat leaving from New Harbor for bluefish, striped bass and flounder. Off the shoreline lie some of the world's finest and largest blue fin tuna, bluefish, swordfish, and marlin ever recorded. Bring plenty of water, as Block Island North Lighthouse is not near any service areas. The views of the beaches with their jutting expansive cliffs are worth the hike if you’re up for the 4-mile trek along the shoreline. You can also bike or rent motor vehicles to get there as well. Enjoy the natural wonders of the 127-acre Block Island National Wildlife Refuge near the lighthouse. The shoreline area runs from Settler’s Rock to Sandy Point and Block Island North Light, and then on to Great Salt Pond. This is an ideal area for walking, bird watching, and enjoying breathtaking views. Setter's Rock marks the landing point of European settlers of Block Island in 1661. Visitors may find most of this island seems stuck in the 19th and early 20th centuries with its Victorian hotels, inns and B&B’s. The Empire Theater, built originally in 1882 as a roller skating rink, stands as one of the very few classic movie theaters remaining in the United States. Boat ferries mentioned below may offer other types of cruises. 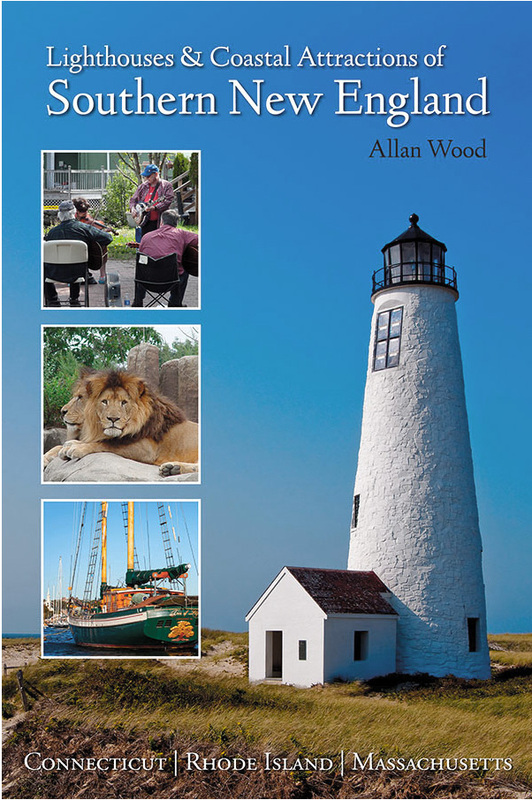 Some may pass by specific lighthouses as part of charters, narrated wildlife and historic tours, and other types of excursions. Snappa Charters has a special Block Island tour around the island so you can get views of the lighthouses from the water. Take exit 92 in Connecticut. Bear right onto North Stonington Road, Route 2. Look for right hand turn for Route 78. At the end of Route 78, go left onto Route 1N. (Look for a sign that says: "Block Island Ferry"). Travel on Route 1N until the Galilee, Point Judith exit, Route 108. Bear right onto Route 108S (Point Judith Rd.) and travel for about 3 miles until you see a right hand exit for the Block Island Ferry. You'll see the Galilee State Pier, across from the Department of Environmental Management. Take exit 9 in Rhode Island, (Narragansett exit) to Rte. 4. Stay on Route 4 to Route 1. On Route 1 take the Narragansett, Route 108 exit. Stay on Route 108S for about 3 miles, then take right hand exit for Block Island Ferry. Block Island is accessible by ferry from Point Judith, RI. 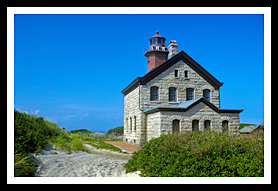 Take Sandhill Cove Road from Point Judith lighthouse, to Galilee ferry landing. Ferry service to Block Island is also available from Montauk Point, NY and New London, CT.
Offers specific lighthouse tour around Block Island in addition to other adventure tours. Block Island's premier twin engine air charter.